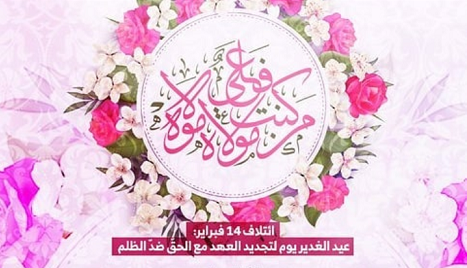 It said in a greeting card published on Wednesday, August 29, 2018, on social networking sites that this great day is Allah's greatest day, renewing the covenant to continue the path of truth, how difficult it is in the face of injustice. It is an extension of a struggle initiated by the Holy Prophet Muhammad, and it will not end until the appearance of Imam al-Huja (PBH). The Coalition added: "From this day free peoples are inspired by lessons and examples in nominating the leader and ruler chosen by Allah (Almighty), and the absolute obedience to His Majesty comes through the obedience of the Holy Prophet and the Prophet’s companions (peace be upon them all) “, stressing that the person who falsely erects and usurps the power, land and the people must be fought, removed from its place and the right must be returned to its owners. Additionally, it called on free peoples to get benefit from this day in the face of injustice and tyranny and move forward to liberate their homeland from terrorism until it has the right of self-determination and return the compass to the path of real Islam.